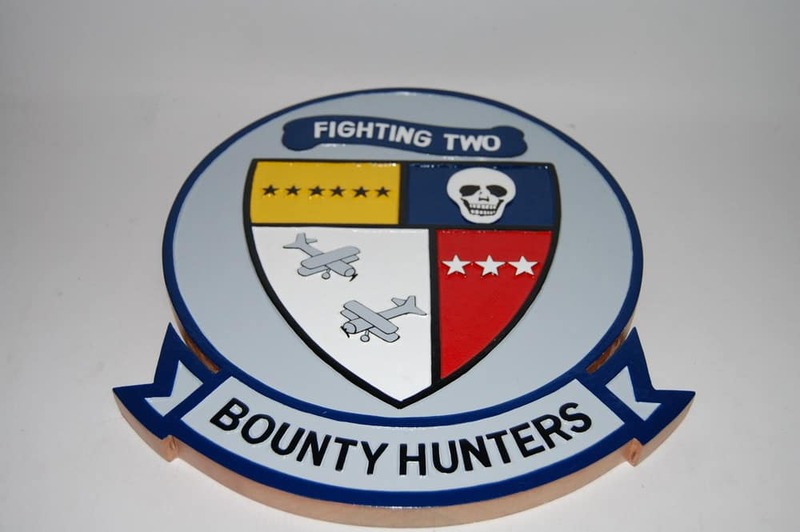 A beautifully carved 14 inch solid wood plaque of the VFA-2 Bounty Hunters! 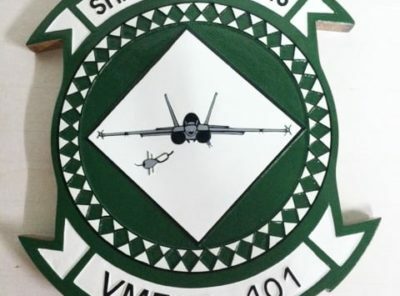 Collect all your squadrons with truly artistic craftsmanship of the Navy’s finest symbols. 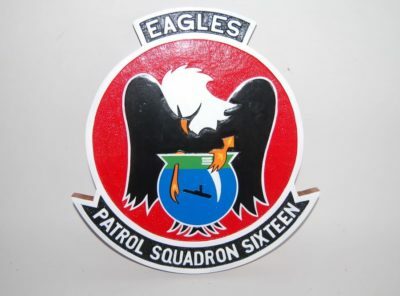 By the mid-point of 1921, the Fleet Air Squadrons had been reorganized, providing an aviation force for each fleet with the squadron as the basis. 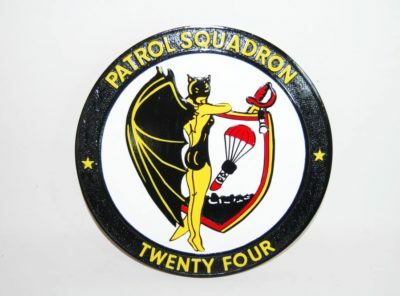 The Air Squadrons, Pacific Fleet, were Spotting Squadrons Four and Three, Combat Squadrons Four (established on 23 September 1921) and Three, and Seaplane Patrol Squadron One. The USS AROOSTOOK was the flagship and tender for the Air Squadrons. 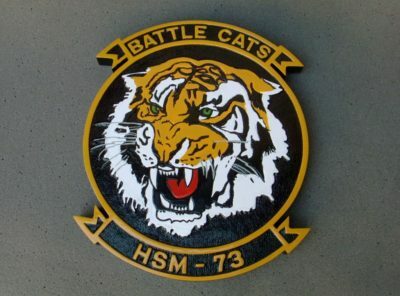 The Commanding Officer of Combat Squadron Four was LCDR William Masek. 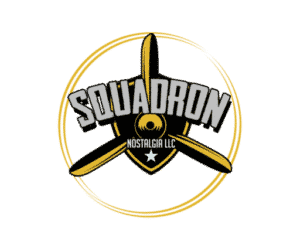 It is believed that Spotting Four and Three, Combat Four and Three, and Seaplane Patrol One were the first formally organized and numbered fleet squadrons to be home-based at Naval Air Station San Diego. From the date the Air Squadrons, Pacific Fleet, were formed at the end of 1919 to the mid-1921 period, aviation units were identified simply as “shipplane,” “landplane,” and “seaplane” squadrons. 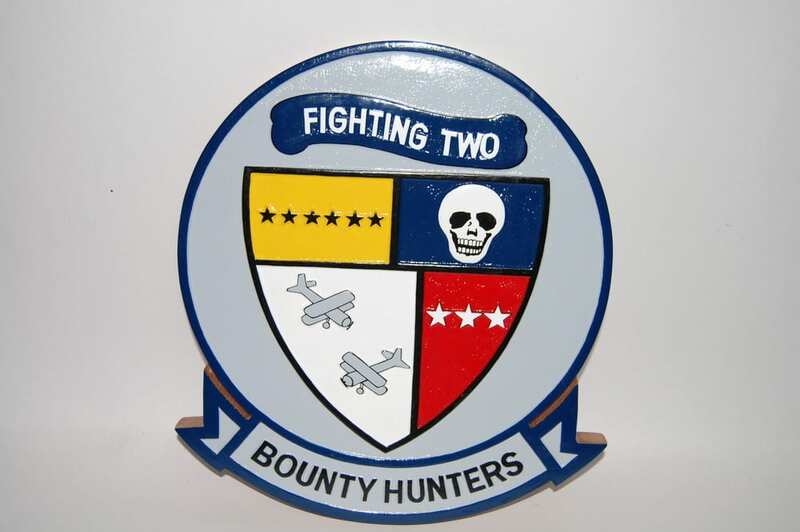 A name that was to stick for many years was assigned the North Island based squadrons in June 1922: “Aircraft Squadrons, Battle Fleet.” They had previously been named “Air Detachment, Pacific Fleet,” “Air Forces, Pacific Fleet,” and finally “Air Squadrons, Pacific Fleet.” A reorganization was underway at mid-year to merge the Atlantic and Pacific Fleets into the U.S. Fleet. 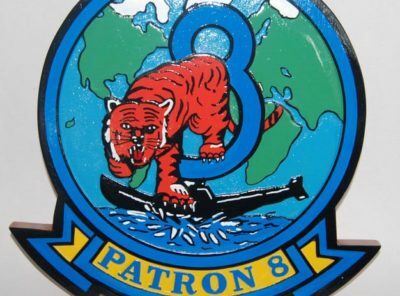 The Atlantic-based squadrons were renamed “Aircraft Squadrons, Scouting Fleet.” Later that year, the squadron numbers were changed so that all squadrons were numbered serially by class in the order where they were initially authorized. The use of letter abbreviations to indicate mission was also adopted: “F” – Fighting; “O” – Observation; “T” – Torpedo Bombing; “B” – Bombing; etc. “V” meant Heavier-than-Air. 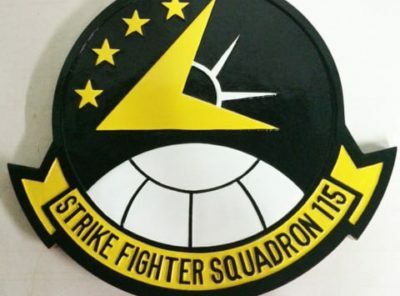 Thus; “VF” would indicate “Fighting Squadron, Heavier-than-Air.” Combat Squadron Four was officially re-designated Fighting Squadron Two on the 1 July 1922. Fighting Two was equipped with the Vought VE-7SF biplane. The c ollier USS JUPITER was converted to the carrier USS LANGLEY (CV-1), the first aircraft carrier operated by the United States Navy, and was commissioned at Norfolk on 20 March 1922. In July, Congress authorized conversion of the unfinished battle cruisers LEXINGTON and SARATOGA to aircraft carriers. Thus, before the Battle Fleet Squadrons were to see the first carrier, two more were on the way. Fleet maneuvers in southern Californian waters were the big story at North Island as 1923 ended. Both Fleets and the Army were to participate. 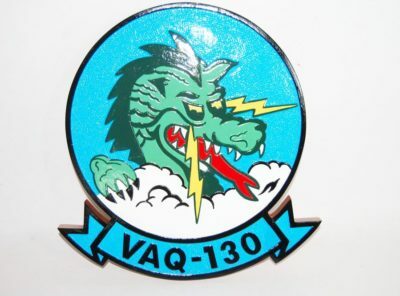 North Island based squadrons VO-1, VO-2, VF-2 and VT-2 took part. On 30 November 1924, USS LANGLEY, called the “Covered Wagon,” was moored at the North Island dock for the first time. This date marks the beginning of her service with Aircraft Squadrons, Battle Fleet. 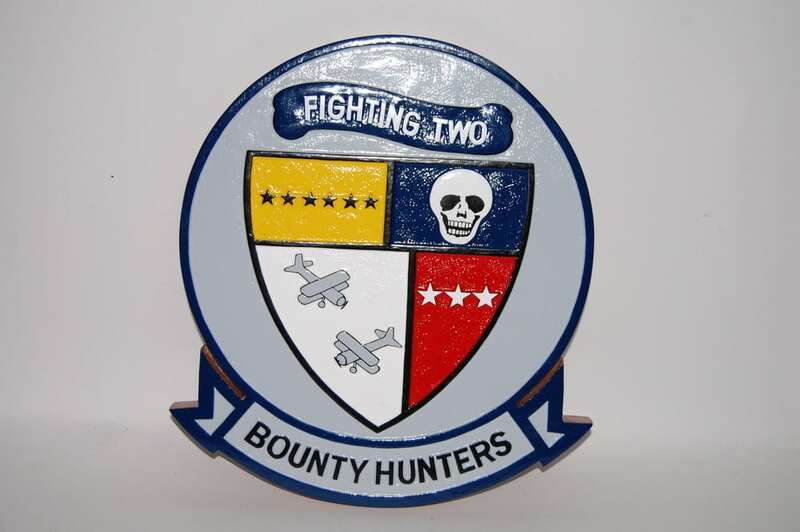 Fighting Two was the first squadron trained to operate as a squadron from LANGLEY. During the closing days of 1924 and early 1925, the planes of VF-2 were equipped for Carrier landing and takeoff. The pilots had practiced before and after LANGLEY arrived, using a wooden platform which stretched across North Island and simulated a carrier deck. After LANGLEY was anchored at the station dock, the real practice began. The pilots flew down the bay, parallel to the carrier. They’d make an approach as if they were landing but would actually be over the water. The deck looked very small since most of the ir practice had been on a wide-open field. Usually it took several passes before the signal officer thought they were ready to try the real thing. When they were ready, they were taken out to sea on LANGLEY and qualified in carrier landings the week ending 17 January 1925. From her date of commissioning, LANGLEY was more than a ship; she rapidly became a tradition. Men who served aboard her, either with the ship’s company or in the squadrons, remember the years of her prime with nostalgia. Maybe it was the era – the all-new quality of flying from a carrier – or possibly LANGLEY was a very special ship. Whatever the reason, the officers and men who served aboard the “Covered Wagon” were intensely sentimental about that service. The year 1925 marked a new beginning for carrier aviation in the United States. Until then, LANGLEY had been experimental. The LANGLEY, with seven pilots and 42 enlisted men from VF-2, took part in Problem V of the fleet maneuvers off the California coast from 7 to 10 March 1925. The air activity off the LANGLEY was limited to scouting in advance of “Black Fleet” movements to the Guadalupe Islands; nevertheless, the performance was impressive. As a result, the Commander-in-Chief of the U.S. Fleet, Admiral R. E. Coontz, recommended that completion of the LEXINGTON and SARATOGA be sped up as much as possible. At the end of 1925, Rear Admiral Joseph M. Reeves became Commander, Aircraft Squadrons, Battle Fleet with USS LANGLEY, GANNET and AROOSTOOK under his command. 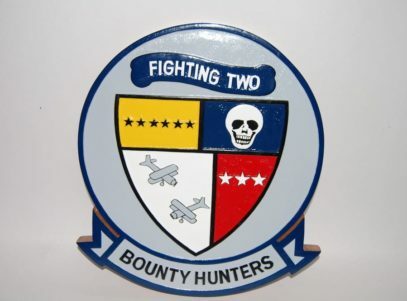 The Fighting Wing squadrons were VF-2 and VF-1. VF-2 was the LANGLEY squadron, while VF-1 operated seaplanes from battleships during fleet maneuvers but was usually shore based. RADM Reeves began his tenure by asking questions and expecting subordinates to come up with the answers. These questions came at a rapid pace in the form of mimeographed sheets, known facetiously as “Reeves’ Thousand and One Questions.” One question was how bombing by carrier aircraft could be made more effective. An answer came from LCDR Frank Wagner, then CO of Fighting Two, when he demonstrated the concept of dive-bombing in March 1926 and later trained his squadron to master the technique.